Well, well, well - is that a new brand I see? Why yes it is! I was overwhelmed to receive a beautiful bundle of goodies from Ginger & Co for a few weeks ago - full of yummy sweets, pretty hearts and of course their fab new products! The packaging caught my eye straight away and I couldn't wait to dig in! So today I thought I was share with you my first impressions of the brand, let you know a bit more about them and show you the products I am currently trying out! Ginger & Co is a British brand born and bred brought to life by the awesome people at HotHouse. (who are also the proud makers of St. Moriz... the best bargain fake tan ever!). They pride themselves on using predominantly English ingredients and helpful English manufacturers - great huh? 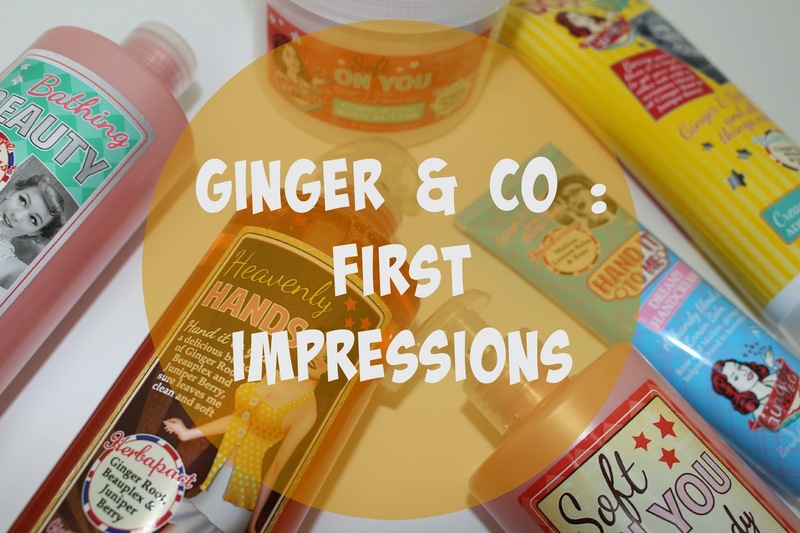 Ginger & Co is all about having a fun, retro-inspired range of glam bath and body products that is accessible to all - and seeing as the prices range from just £2.99 I think they've hit the nail on the head. The products I have are all full-sized and are amzingly large sizes for the prices they are - talk about value for money. Here we have the 500ml Bathing Beauty bubble bath and the 250ml Double Up! body wash which are both priced at £3.99 each - a total steal for the size of the products! Total skin saviours these 2 have been created to help keep your skin happy and moisturised! The bubble bath has Marshmallow leaf and lemon balm in to help keep your skin hydrated, which is great for the upcoming spring months - coz we all know we'll be shaving those legs more! Ginger & spice and all things nice - Double Up! bodywash keeps the skin clean whilst moisturising at the same time. Revive your senses with energising ginger root and detoxifying juniper berry - alot more fun than my boring Sanex I have to say! Now these two are both Soft On You - one a daily body lotion and the other a body butter! This is perfect for me as I don't always have time to use a body butter as they take longer to sink in, so a body lotion alternative is always welcome in my home! They smell lovely and have some fab ingredients such as rose leaves and marshmallow leaf which makes them smell gorgeous! Last but not least we have my favourite two products - the hand savers! Firstly the Heavenly Hands hand wash. Now this had me sold before I even used it, mainly due to it's size! I am fed up of buying new hand soaps for my kitchen and bathroom constantly because me and mu boyfriend go through them like there's no tomorrow! This is 500ml so will hopefully last us for weeks and weeks ... plus it looks alot prettier than Carex and is only £3.99. And last but not least Hand It To Me, a dreamy handcream. I'm a huge hand cream lover and always have one with me in my bag wherever I go, this is only £2.99 for a 100ml - bargain! This stuff is great, soothing and hydrated AND it looks cute too. So there we have it, Ginger & Co - a winner of a new brand in my opinion! Not only do these look great and all cost under £5 but they really do work. They make lovely little presents for friends and family too! What gorgeous packaging and they sound like some great products. I've tried a few things from Ginger & Co and I loved them. I have the body wash, body lotion and hand cream all of which smell amazing. I'll definitely be picking up more of their range. I love the retro style packaging. I love the retro/vintage packaging! Might have to try the Soft on you products!